Three prominent public universities–Florida, Maryland, and Washington–will begin using the application process developed by the Coalition for Access, Affordability, and Success (CAAS), a recently formed consortium of more than 90 leading public and private colleges and universities. Note: A list of all public universities listed as CAAS members as of March 9, 2016, is below. To qualify, as of now, for membership in the CAAS, a school must have a six-year graduation rate of 70 percent or higher. Several prominent public universities that qualify have not yet joined, among them all of the University of California institutions, UT Austin, and UW Madison. Jaschik writes that the UC campuses have not joined because of present concerns about the ability of community college transfers to use the process effectively. UC schools have strong and highly successful articulation agreements with the state’s community colleges. UT Austin questions the fairness of the new process, at least in its initial form. “Associate director of admissions Michael Orr said UT did not apply to the coalition because of criticisms of the programs, including the coalition’s failure to consult with high school counselors,” according to Jameson Pitts, writing for the Daily Texan. “The argument within the community … has been that there is a concern that students with means will be the ones that will be able to take advantage of that opportunity the most,” Orr said. He did not rule out the possibility of joining the Coalition if concerns about fairness can be resolved. Several voices in the higher ed community have opposed the Coalition, saying that students are already over-focused on preparing for college admission and that the new approach will favor more privileged students. Our question is this: If the new process is designed to help students who cannot afford college counselors and lack effective guidance in their schools, how will the students find out about the process in the first place and learn to use it to good effect? Whatever the possible shortcomings may be, the CAAS has gained the membership so far of the 36 public universities listed below. It is important to note that only Florida, Maryland, and Washington have decided to use the CAAS process exclusively. The other schools listed below will, as of this date, use either the Common App or the CAAS process. The annual Times Higher Education World University Rankings have had the strongest presence in the ranking “world” since 2004, but here’s one vote for the U.S. News Best Global Universities rankings being better even though they have been around only two years. Both are useful because they measure the prestige and research impact of hundreds of universities around the world at a time when there is much more international cooperation–and competition–among institutions. It is rare for us to applaud the U.S. News rankings because there are many serious issues with the annual “Best Colleges” publication. It over-emphasizes the financial resources of colleges and their selectivity, to the detriment of most public universities. But when it comes to world rankings, U.S. News drops the focus on financial metrics in favor of academic reputation and research metrics, including the use of regional reputation surveys that help to offset the eurocentric bias of the Times Higher Ed rankings. For example, the Times Higher Ed rankings list 42 European universities among the top 100 in the world, while U.S. News lists 31. The main reason is probably that the Times rankings do include financial metrics and do not factor in the additional regional reputation data. Below is a table showing the U.S. public universities ranked among the top 100 in the world by U.S. News alongside the rankings of the same universities by Times Higher Ed. An additional column shows the average ranking of each school when both ranking systems are used. The average ranking of leading U.S. public universities by U.S. News is 44 out of 100; the average Times Higher Ed ranking of the same schools is 82. Updated September 24, 2017, to include revised honors class sizes. Parents and prospective students are often interested in the average size of course sections. Assessing class size is extremely difficult because, first, a “class” has to be defined. Why is that difficult? Some main sections (often in intro science, economics, business, etc.) may be very large, well in excess of 100 students, but the breakout labs and discussion sections are much smaller. Should only the main section be counted, or should the labs and discussion sections also be included? The best source for class size information and interesting data in general is the Common Data Set. Some universities publish their submissions, while others do not. The data in the CDS are used by U.S. News for many purposes, including the calculation of the percentage of classes with fewer than 20 students and the percentage of classes with more than 50 students. Using that information, we can also calculate the percentage of classes with enrollments between 20 and 50 students. U.S. News does not include tutorials, thesis research, lab or discussion sections, and neither do we in our estimates of class sizes for honors programs. According to our counts, the average public university honors-only class section has 19.0 students. When we include honors credit classes that also have non-honors students, the overall average class size is 26.3 students. This is an important consideration, given that the tables below show that public universities have significantly larger class sizes. The next level of difficulty when using U.S. News data is to plug in an average number for the three class size groupings. For the group of fewer than 20 students, we are using an average of 17.5 students per section; for the group of classes with 20-50 students, we are using an average of 35 students; and for the group of classes with more than 50 students, we are using an average of 110 students. The first table below shows the overall average class size for 92 national universities, when all three class size groups are used with their corresponding percentages. The second table below shows the average class sizes of the same universities when the the group of more than 50 students is excluded. The reason: Anywhere from 75% to 91% of all classes have fewer than 50 students, so most of a student’s experience will not be in the large sections. Editor’s note: This post updated on October 1, 2016, after release of Times Higher Ed Rankings for 2016. It is likely that Philip G. Altbach, a research professor and the founding director of the Center for International Higher Education at Boston College, has the sharpest eye of anyone in America when it comes to seeing how well U.S. universities compare with rapidly improving institutions throughout the world. What he sees is not good. U.S. public universities are losing ground to foreign institutions, most notably in Europe and Scandinavia. (Below the following text are three tables. The first compares the Times Higher Ed world rankings of U.S. universities and those throughout the world for the years 2011 and 2016. The second shows the decline in rankings for U.S. public universities for the same years. The third and final table shows the rise in rankings for U.S. private universities. One reason: All the bad publicity about cuts in funding, along with high-profile political grandstanding that has received far too much attention throughout the world academic community. For example, UT Austin endured years of highly publicized attacks by former Governor Perry during his second term, and UW Madison has been hurt by similar actions on the part of Governor Scott Walker. The average ranking for the 23 U.S. publics among the top 100 in the world in 2011 was 39th, while in 2016 it was 49th–and only 15 publics were among the top 100. Meanwhile, leading U.S. private universities have seen both their average reputation rankings and overall rankings rise since 2011. To illustrate Professor Altbach’s point, we have generated the tables below. This table compares the Times Higher Ed world rankings of U.S. universities and those throughout the world for the years 2011 and 2016. The following table shows the decline in rankings for U.S. public universities for the years 2011 and 2016. UC Davis is the only school to rise, while most dropped significantly. This last table shows the rise in rankings for leading U.S. private universities for the years 2011 and 2016. Is It True that 80% of Elite Students Are Accepted by Elite Colleges? Editor’s Note: The following post examines the claim by the New America Foundation that acceptance to elite colleges is not any more difficult than in the past, with 80% of highly qualified applicants still being accepted by elite schools. What we found is that even with the additional elite slots offered by honors colleges and programs, there are not enough slots to accommodate 80% of elite applicants. Although the acceptance rate as indicated by probability statistics (given multiple applications by each student) might show a high acceptance rate, the enrollment rate must be significantly lower than 80% for elite students. Updated with important changes, March 21, 2016; updated September 18, 2018, with references to new SAT scores. Kevin Carey is director of education policy at the New American Foundation, and recently he has argued (1) that the end of college as we know it fast approaching, thanks to technology, and that (2) reaching a good college isn’t as hard as it seems. Carey has little use for research universities, a “hybrid” form of higher education whereby students are offered the “bait” of being able to study with well-known research professors only to experience a “switch” once they are enrolled, finding themselves under the inept tutelage of callow TA’s and lower level faculty. The advent of MOOCs will give rise to the university of, and for, everyone, leading also to the “brutal unmasking” of hybrid universities as the pretenders Carey believes them to be. At the end of the post, there is a list of colleges, universities, and public honors programs with mean SAT scores of 1380 or above. Setting aside Carey’s curious approach of proclaiming the end times for traditional colleges on the one hand while announcing the cheerful prospects for enrolling in these same colleges on the other, we will focus only on his assertion that approximately 80% of highly qualified college applicants are now able to gain acceptance to an “elite” college, never mind the dire comments on how much tougher it is now to get into such institutions. According to Carey, “the slots themselves [at elite colleges] aren’t becoming more scarce and the number of students competing with one another isn’t growing.”As we suggest below, the problem with this statement is that the slots Carey is talking about seem to be plentiful because the colleges he includes are not as elite as the students he is tracking. Therefore, while it may be true that 80% of applicants gain acceptance to the 113 colleges he is tracking, it is highly unlikely that there are in fact 113 schools whose mean test scores match the threshold scores of his applicant cohort, or that have sufficient slots to actually enroll those students. Indeed, the only way all of these students can attend colleges that even approximate their level of credentials is for many of the students to attend the very “hybrid” universities Carey criticizes. We followed up on Carey’s assertion by doing some research of our own. Using the 25th percentile scores and the 75th percentile scores in the 2015 U.S. News rankings and dividing the total by two in order to arrive at an approximate average, we found that, rather than 113 colleges with average (old) SAT scores of 1300 or higher, there are only about 86. In addition, there are 51 public honors colleges/programs with mean (old) SAT scores of 1300 or higher. For purposes of illustration, we assumed that there was a like number of private honors colleges and programs, though we believe this is a generous estimate. Then we calculated the number of students who took the ACT and SAT in 2014 and who score in the 91st or 92nd percentile or higher on one or both tests. An SAT score of 1300 is the 91st percentile; an ACT score of 29 or higher is also at the 92nd percentile level. We estimated that 25 percent of the 345,250 students took both tests; again, this is probably a generous estimate. This estimate should also take into account the relatively small number of high scorers who do not have high school GPA’s commensurate with their test scores. The result: about 259,000 students met the test score threshold in 2014. Next, we calculated that of the 86 colleges and universities with mean test scores at the threshold or higher, there were 131,077 places for freshmen in 2014. This leaves a deficit of 127,923 places for highly talented students, or more than 49%. Using exact figures for public honors colleges and programs with similar test score profiles, we added another 20,917 places. Then we added another 20,917 places for private university honors colleges even though we doubt that there are that many honors places in private schools. Therefore, the total number of “elite” places in 2014, including honors program places, was approximately 172,911. Subtracting this number from 259,000 still yields a deficit of elite places in the amount of 86,089. New America claims 80 percent of elite students were accepted, but it is extremely unlikely that they could have actually found a place in the elite group of schools we have identified. So, if we take .8 x 259,000 students, the result is 207,000 students who should have been accepted by elite schools. Subtracting 172,911 places from 207,000 still leaves a deficit of elite places in the amount of 34,289 places. Again, the actual deficit is probably higher. From these calculations, it appears that the acceptance rate for elite students, if they were to apply to schools with mean test scores at the threshold level or higher and not to less selective schools, would not be 80%, and it is very unlikely that there could be enough truly elite places for 80%. This is based on the calculation 172,911/259,000. That there is “room” for about 67% of elite students in elite colleges may not be a panic situation, but some elite students should be prepared to attend colleges whose mean scores are somewhat lower than their scores. For the time being, there are solid alternatives at relatively low cost, at least for in-state students: those discredited “hybrid” institutions. Washington, Wisconsin, UT Austin, Florida, Penn State, UC Davis, UC Irvine, UC Santa Barbara, Ohio State, Georgia, Rutgers, Connecticut, Purdue, and Clemson may not have had average test scores in 2014 that meet the New America definition; but surely many of the elite students choose to attend these universities, in addition to those who are accepted by the more selective honors programs at most of these schools. Indeed, New America probably included these and other prominent public and private universities in its list of 113, despite their average test scores being somewhat lower than those of the elite students they tracked. The estimated total number of freshmen slots at the 14 state schools above is about 104,771. At these schools, there are perhaps 40,000 to 52,500 freshmen who meet the elite definition. This should leave no doubt about the need for these universities to sustain or enhance their current level of excellence: they are necessary, as are public and private honors programs, if top students are to actually “reach” schools that approximate their abilities. Below are the universities, colleges, and public honors programs we have identified as having mean test scores of SAT 1300/ACT 29 or higher. 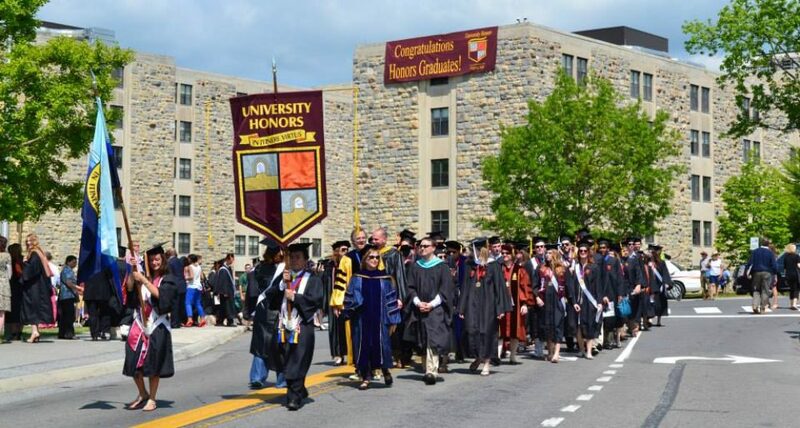 Not included is a list of private honors colleges that meet the threshold; as noted above, we have estimated the number of students accepted by these honors colleges. The public honors colleges and programs are in listed in bold type at the end. Be sure to check out the updated post, US News National University Rankings, 2012-2019. Latest rankings. US News has changed methodology for 2019 and there are some surprises after the first 35 places or so. As promised, we are providing a table showing the U.S. News national university rankings from 2008–2015. Listed below are the yearly rankings of 125 national universities that were included in the first tier in all the years covered. Sixty three universities are public, and 62 are private. There is now an updated list through 2018. As a group, the private universities have had an average increase in the rankings of two places, while the public universities have had an average decline of three places, demonstrating what we have observed in the past–public universities are, in general, not on an upward trajectory in the rankings. One reason for the phenomenon is increased “gaming” of the rankings. Some institutions, public and private, but mostly the latter, have geared their marketing and merit aid to increase the number of applicants and lower their acceptance rates accordingly. This makes them more “selective” and helps to improve their rankings. Northeastern University, for example, has risen an astonishing 54 places in the rankings since 2008 and is now ranked higher than Washington, Penn State, UT Austin, Wisconsin, Tulane, Florida, Pepperdine, George Washington, Maryland, Pitt, and many others. It is now tied with Illinois, UC Irvine, and RPI. How likely is it that in the space of eight years Northeastern has really improved from 96th to 42nd? The U.S. News rankings not only over-emphasize the metrics related to a university’s financial resources but also, especially in the last five years or so, reward selectivity when, in fact, the results of the selectivity are already considered. Why should Stanford be rewarded for having an acceptance rate of 5% and be rewarded for having high graduation and retention rates, both of which are largely the result of selectivity. Using test scores as a factor in predicting what grad rates should be is fine, as is rewarding or penalizing schools for exceeding or not meeting such predictions. But the high scores themselves and the low acceptance percentages merely duplicate what is more properly measured by outcomes. We will have more to say on these issues in the future. But for now, here are the historical rankings, the average of each school across eight years, and the increase or decline of each school from 2008 to the present. The universities are listed in order of their average ranking across the years. Editor’s note: The following list comes from a post by college consultant Nancy Griesemer, who writes regular for the Washington Examiner. Read the full post, and consult the always fascinating UCLA Freshman Report for more information. Griesemer notes in her post that while 73% of applicants are accepted by their first choice college, only 55% end up enrolling at that institution. Clearly, cost is a big factor behind these stats, and points to an issue of concern to us: finding a place for students smart enough to get into elite private colleges but cannot attend the private school of their choice for financial reasons. In addition, with the current emphasis on selectivity as a major metric in the U.S. News rankings, highly talented students are being ever more widely recruited by elite universities and, at the same time, finding their odds of acceptance significantly reduced. For these students, the relatively high first choice acceptance cited above does not obtain. So…insufficient merit aid to offset costly private tuition and expenses, plus capricious selectivity designed to make schools look better by rejecting smart applicants, have helped boost public honors programs where students can find quality at a lower cost, along with a better overall mix of students. The arrows below indicate whether the response percentage has increased or decreased since the previous year’s survey. Keeping up with the National Science Foundation Graduate Research Fellowship Program grants is an annual project we undertake because the grant stipend, valued currently at $32,000 a year for three years of graduate work plus a separate $12,000 a year paid directly to the university for costs, are so generous that prospective undergrads might want to know graduates of their college of choice perform in the NSF GRFP competition. The grants go to students with very high college gpa’s (around 3.70 and above) along with outstanding GRE test scores. Grantees must submit proposals to do research in one of the STEM disciplines or social sciences. Most grants are for STEM students. This year we will list the top 30 universities, both public and private, whose students were named as NSF GRFP fellows in 2015. It is true that many public universities have much larger overall undergraduate enrollments, so one might expect that those schools would have the most NSF fellows; on the other hand, the private elites are far more selective, and one would think that a far higher percentage of their undergraduates should be competitive for the awards. We write primarily for prospective honors students and their parents, so our perspective is that the best students in leading public universities can compete with those coming from private elites, and the NSF awards are one indication that this is the case. One indication of a rough parity is that the top two universities are far and away the best this year–MIT and UC Berkeley–one private, the other public. Both are perennial leaders in this category. Below are the leading universities for NSF fellowships in 2015. All the schools had at least 15 NSF fellows. In this age of anxiety about finding a good job after college, many parents are understandably concerned if their sons and daughters haven’t settled on a major in their first year of study, or if they have changed their major from a lucrative field such as engineering to, say, a social science field. The Higher Education Research Institute (HERI) at UCLA is renowned for its insightful reports on the characteristics and attitudes of college students, especially during the freshman and senior years. The latest HERI survey report on Your First College Year has revealing data about the career focus (or lack thereof) and the frequency with which majors are changed during the extremely important first year. The survey is based on responses of more than 10,000 students at 47 colleges and universities. but only 25% had a clear idea of how to achieve career goals. and of the 27% of students who felt at the beginning of the year that they were only average in problem-solving skills, 43% thought their problem-solving skills were somewhat of a strength at the end of the year. So parents, if your son or daughter doesn’t have it all figured out after that first year, take heart. The very complexity that they are dealing with is teaching them at the same time how to figure things out, including their eventual majors and career paths.